Various front fender options are available for the 5GN and 5GV Series ex-factory and as attachments to protect the cab from debris while turning. Rear fender extensions are available for the 5GN and 5GV Series ex-factory and as attachments to protect the cab from debris. The optional beacon light is available ex-factory. 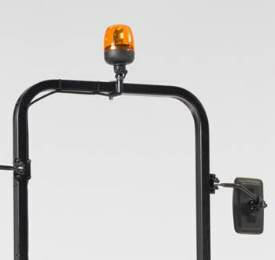 The beacon light is mounted at the rear of the cab roof and can be folded backward to prevent breakage in areas with low overhead clearance. 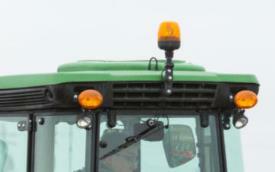 On open operator station (OOS) tractors, the beacon light is mounted in the center of the rollover protective structure (ROPS). 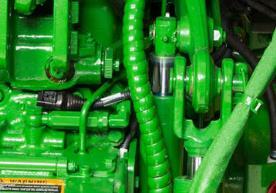 If the tractor is ordered ex-factory without a beacon light, the cab still includes the basic wiring preparation. The missing components like the in-cab switch, mounting bracket, and light can be ordered with the following field-installation kit. The optional deluxe cab seat provides an excellent driving position and superior operator comfort for long working days in rough terrain. It has a wide seat and backrest with wrap-around padding to hold the operator in the seat when travelling over rough or sloped terrain. The improved carbon filtration system reduces the amount of dust or pollen entering the cab for a more comfortable work environment. 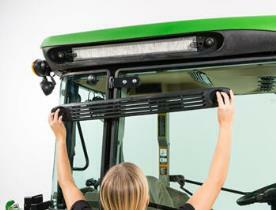 The carbon air filters are located on either side of the cab roof and are easily accessed without requiring tools. 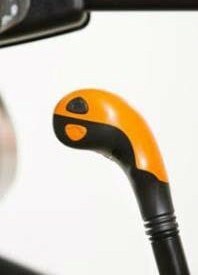 The optional rear windscreen wiper with washer provides single speed wiping of the rear windscreen in wet weather to maintain good rearward visibility to implements or trailers and is available on the 5GN and 5GV cab tractors. 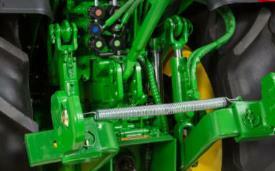 Stationary front fenders: chassis-mounted front fenders which are fixed. 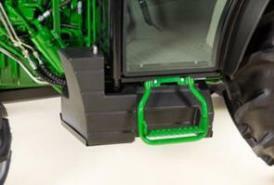 Rigid front fenders: fenders are only turning with the front wheel.